I was reading through the articles on Yahoo! Singapore news yesterday evening when I stumbled on one that got my attention. As many of you know, there were rumors on Twitter that something happened to Lee Kuan Yew. I don't know about you but I was hoping whatever I read wasn't true. Anyway...this article revealed some of the people that were responsible for starting the horrible rumours. I wasn't surprised to see one name though. 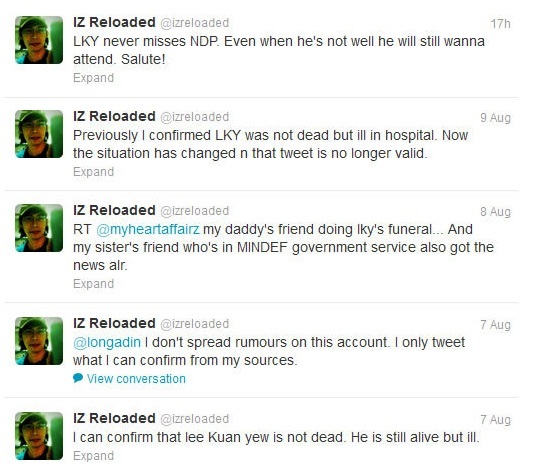 He goes by the online moniker IZreloaded. In case you are wondering, his real name is Haizat Darson Latiff. Under the one man show web TV network that he runs, I hosted Singapore Haunted and Tattooed last year. To sum things up...I worked extremely hard but I wasn't given the money I was promised. Yup, not a single cent! That's the kind of guy he is. He makes promises, tells you that you'll be paid and when push comes to shove, he pretends like nothing happened. Watch our Singapore Haunted cast reunion video and you'll see what I mean. So regarding the 'sources' that Haizat mentioned, I can tell you first hand that it's a load of crap! When we were filming Singapore Haunted, he would always say "Oh my sources have informed me that this location has this and this and this". Guess what? Each damn time he mentioned his 'sources', nothing happened. Absolutely nothing! It's safe to say that his 'sources' are just voices in his head! I have no respect for this person and I've been waiting patiently for him to screw up. We all knew he would. It was just a matter of time. Many of us are smiling and if you could see the satisfaction on our faces, you would grin too. What the hell, they said they fired and terminated you. And you did 7 tatoos for the show and they never freaking pay you?? We found the fired and terminated part funny. I mean, how do you fire someone who did 7 episodes for Tattooed and 12 for Singapore Haunted when he hasn't been paid a cent! Transportation wasn't paid for either. Oh well...lesson learnt! Never trust assholes!